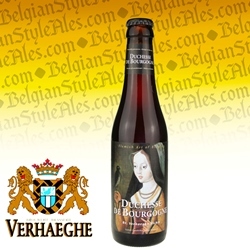 The current flagship of the Verhaeghe Brewery, Duchesse De Bourgogne (Duchess of Burgundy in English) is a bottle conditioned blend of mature and young sour ales matured in oak barrels for 18 months. The brew pours a dark brown color with a thin tan head and a 6.0% ABV. Aromas of dark fruit, bread, apple, toffee, vanilla, and tart sour cherries herald a flavor profile that charts a similar course and also includes vinous notes of red wine, oak, malt and chocolate. The mouthfeel is smooth and medium-bodied while the finish is crisp, bittersweet, and dry. Ratebeer.com rating: 98 (out of 100) 11.2 oz capped bottle. Pair with buttery cheeses, spicy peppers, roasted turkey, venison, lamb, or prime rib. It would be the perfect beer to match with (or feature in) a sorbet; also goes well with rich and dense desserts.